A few simple tips can dramatically improve the design of your trifold brochure. A company brochure is a valuable sales tool. Business cards, posters, and catalogs all have their place in your company’s lineup of marketing materials, but when you need to give clients or potential customers specific, detailed information, there is no substitute for a trifold brochure. Here are a few folded brochure tips to help you design yours for optimum impact. PrintPlace.com will provide you with brochure layout guides of different sizes. These are available for download; you’ll just need to select the correct size and fold you are looking for. Using the provided layout guides will ensure that the final piece has the proper bleed and fold lines so you can easily create your trifold design. Be sure your panels make sense. 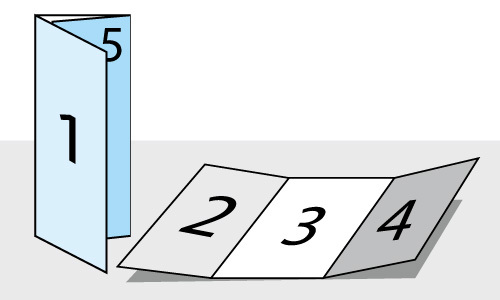 Think of the natural order of a trifold brochure. Keep it easy for your customers to read by offering small amounts of information on the front cover and small inside panel. Use the inside 3 panels for your product descriptions and services offered. Avoid placing important information on the far right inside panel. This is the last panel to be seen when reading a brochure and it can sometimes be overlooked. Bring attention to the front and back panels. The design of your front panel will make or break any trifold design. Make sure the front panel catches your customer’s eye. It should communicate exactly what you are trying to sell or say and engage the customer with images that communicate your company's core values. Don’t rule out the back panel though. Often this panel gets left blank or something simple and irrelevant gets thrown on there. Think of this space as an oversized business card. Add your location and contact information here so your customer can find it easily. You can also add a reinforcing statement and a call-to-action here as well. Traditional trifold brochures are set up to have 3 separate columns of information on the inside panels. Design your full page layout to be different! Try a title page on the far left panel and your story or information spread fully across the remaining 2 panels. Use high resolution images to bring attention to certain areas of your brochure and don’t be afraid to have your text or images bleed into the next panel. Print and fold a mock-up. Print your final brochure at home so that you have an idea of what your customer will see. Once you see your end result, you’ll want to have someone else proofread it to be sure everything is spelled correctly and you have no grammatical errors. You should also be sure the fold lines are correct and your panel order makes sense by reading it like your customers would. Sometimes seeing it laid out on a screen can be tricky, so this step is very important to ensure everything is exactly how you want it. Overall, remember to use a front panel that really grabs a customer’s attention, tell your story across each panel, and separate different features with lines or other graphics. Keeping these tips in mind can help ensure that your brochure effectively does its job. When you finalize your trifold brochure design, print it with professional quality.